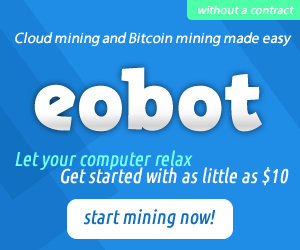 Eobot is a cryptocurrency mining pool and it offers cloud mining products such as Cloud SHA-256 2.0/3.0 GHS. Currently, it supports to mine Bitcoin, Litecoin, BlackCoin, Namecoin, Dogecoin, Dash, Reddcoin, BitShares, CureCoin (Cloud Folding), StorjcoinX, Monero, Counterparty, Stellar, Bytecoin, Peercoin, NXT, MaidSafeCoin, Ethereum, DAO, Lisk, Factom, Voxels, Gridcoin (Cloud SETI) and Gold. You can mine on your own hardware using their miner software on Windows, or join their pool (SHA-256, Scrypt, X-11) using some other popular miner such as cgminer, cpu miner on Windows as well as Mac/Linux.To speed up your mining, you can buy their cloud (using your cryptocurrency deposit, PayPal Credit Card or US bank transfer), the 5 year rental contract for Cloud SHA-256 3.0 GHS is now about $0.90 per quantity (subject to Bitcoin price change, with total supply 100 THS). However, as they suggested, "Cloud mining should be considered as a fun, recreational activity and not a source of income or investment", it is not wise to invest too much. You'll receive one free Dogecoin when you log in and can get about 2000 Bitcoin satoshi through their faucet, everyday. 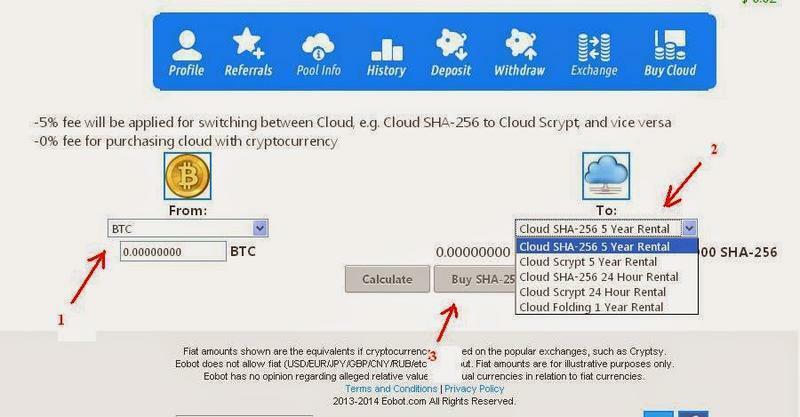 You can deposit, exchange and withdraw your cryptocurrency and the cloud rental in your eobot account; and the exchange fee is 5%, withdraw minimums are 0.001 BTC, 0.2 ETH/LTC/DASH, 1.0 DAO/CURE/PPC, 10 XRP/XMR/FCT/LSK/BLK, 100 DOGE/VOX/MAID/BCN/GRC, 1000 BTS/XEM, 10000 RDD, 1g GOLD. Tips (How to mine without investment/claim free mining power from faucet): After registration, go to your account, change "Mining:" (top left corner) to "GHS 4.0" "GHS 3.0" or "GHS 2.0", then go to Menu Products -> Faucet (top right corner), you can claim free (cloud mining power) GHS contract everyday. Now you have some cloud GHS, you can change "Mining:" to what you want to mine. It's suggested to mine DOGE Bytecoin (BCN) as a beginner because it has the lowest withdraw threshold. The faucet will give you what you're mining when you claim. It's not suggested to claim some cryptocurrency and then exchange it to cloud mining power because there will be a >=5% exchange fee. So it is better to claim GHS contract directly (always change "Mining:" to GHS before faucet claim, after your claim, change "Mining" back what you want to mine). To mine multiple coins at the same time, change "Mining:" to "Diversify", so you can select more than one coin you want to mine. P.S. 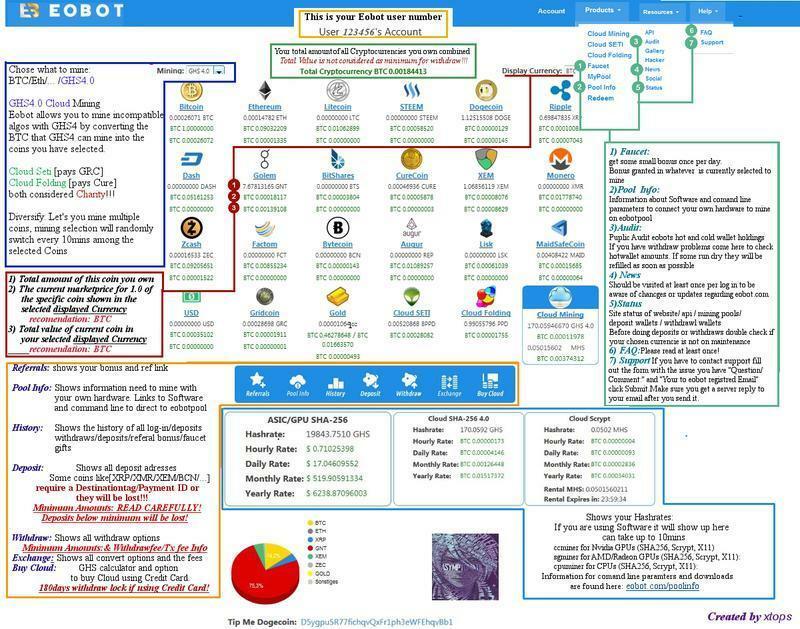 you can also use Eobot as an online multi-cryptocurrency wallet (with no withdraw fee and no fee for deposits but with minimum deposit requirements: 0.0001 BTC, 0.001 ETH/LTC/DASH, 0.01 DAO/CURE/BLK, 0.1 XMR, 1 DOGE/XRP/FCT/PPC/MAID/GRC, 10 RDD, 5 BCN, 100 XEM), or an instant cryptocurrency exchange service because you can deposit and exchange between any two of the cryptocurrencies it supports at any amount (however, the exchange fee is a little high from 5%).